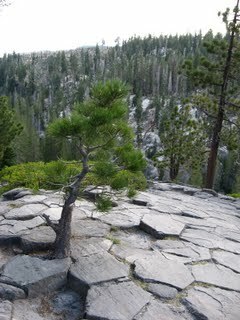 I camped in the Inyo National Forest near Devil's Postpile National Monument. 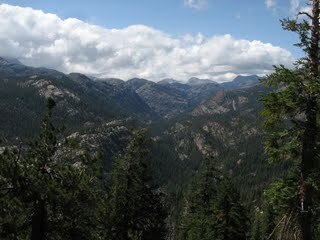 The view as I descended down toward the Postpile area was absolutely stunning. The jagged Minaret peaks jutted above snowfields and granite worn smooth by glaciers. It got incredibly cold one night, with hail falling in the morning, covering the ground. This cold front drove the mosquitoes to lower elevations. Clouds hung over the mountains. 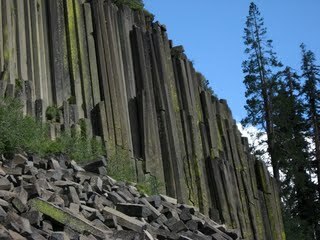 I hiked to the Postpile itself, a stunning example of columnar cracking that occurs when molten rock cools at an even rate. Devil's Tower (that striking tower featured in Close Encounters of the Third Kind) is another example of this kind of formation. 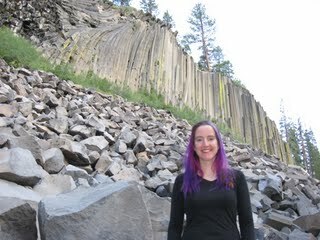 One really amazing aspect of Devil's Postpile is that the top was carved off by a glacier. 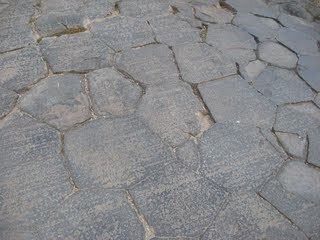 I hiked up there, where the hexagonal tops of the columns had been worn smooth by ice.